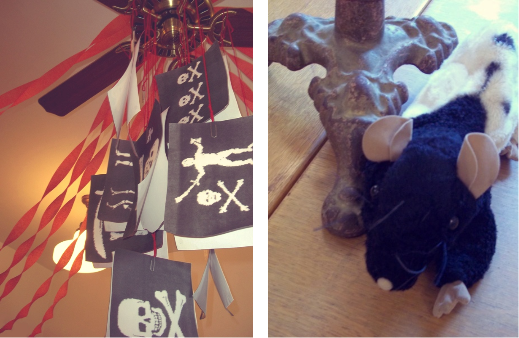 At my library, we're a little obsessed with pirates. We can't help it, they're just too cool. Every year we have a pirate themed storyhour, so we couldn't resist putting one on our calendar this year. When it came down to it, we were so busy that we had to plan the day before. So this event was really simple. We divided the kids into two groups, having one group be the Blue Ship, and the other the Red Ship. Then we read them a book of pirate trivia, and had them answer questions to earn points. Educational and easy-peasy. But eventually, like all good pirate get-togethers, the talking gave way to swordplay.